After the game we went down to find a party going on outside Bar Italia. Definitely the place to be after you've watched the game somewhere you can see a screen. But how come some smart Italian brand hasn't sponsored a huge screen outside Bar Italia? Peroni, Illy, Vespa - come on! It would be really cheap marketing and you'd have a huge impact. For the second half we went over to Marinos in Rathbone Place. The place was packed and had a great atmosphere. Well worth checking out for the next Italian game. We walked up to Bar Italia to find the whole street packed and the Italian commentary blaring out. The only problem is the screen is too small to be seen from more than a few feet away. 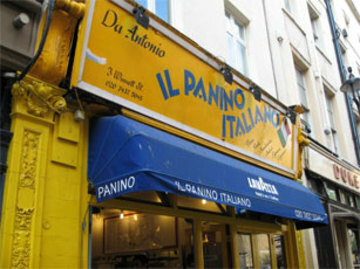 So we went round the corner to Il Panino which had around a dozen Italian fans watching the game on two TVs - with the Italian commentary of course. Our good friend Matteo tells us that Santa Lucia in Fulham has the best pizza in town, 4 Samsung LCD screens and "lots of babes". So it could be a civilised alternative to the crowded bars. But given Matteo is the most Italian Italian we've ever met, there will be plenty of passion there. As long as I have lived in Hackney, the Fox has seemed like a dodgy boozer. Very close to my old house I only went in once and decided everyone else there was a gangster - pictures of the Krays on the wall etc. But times move on, and its now ran by a Sicilian alumni of Jamie Olivers 15. And as well as great food, it has a big retractable screen that they bring out for Italian football. 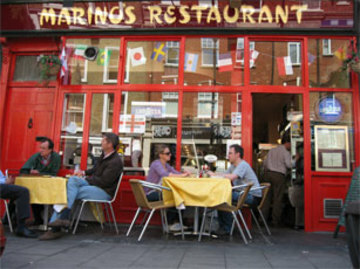 Marino's in Noho's Rathbone Place is the preferred match watching venue for London based fans of Juventus, so they'll have big crowds for all the Italian games. 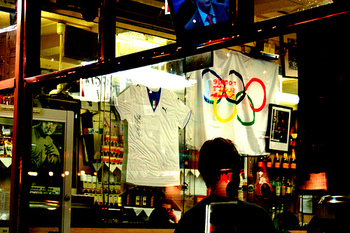 Given Bar Italia will be packed for all the Italian games, we've found a couple of other good venues who will be showing the games. 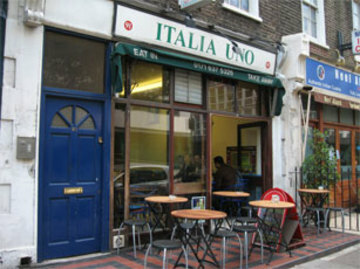 If you've ever been down Frith Street on the night of a big Italian game you'll know how packed Bar Italia gets. The whole bar is dressed in football flags and with a big screen its THE place to watch Italy this World Cup. But given how busy it gets we need some more venues - tell us in the comments and we'll check them out.